This October, communication between the world of VC-backed technology companies and the rest of the Bay Area reached a new low. A number of Airbnb ads posted on billboards and at bus stops around the city proposed different uses for the $12 million dollars in hotel taxes the company trumpeted that it had paid in the last year. Most of the suggestions were flippant and aggressively cute—“if you do spend all $12 million in one place, we suggest burritos”—but one of the bus stop ads in particular, addressed to the public library, largely drove the backlash that caused the company to issue an apology a few days later for its utter tone-deafness. The ads were quickly taken down. The bus ad in question was formatted as a letter on a monochrome background of Airbnb’s signature coral pink. 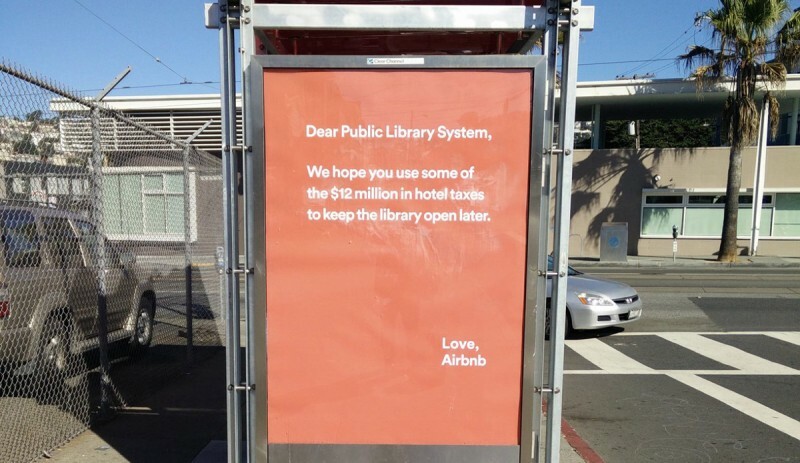 “Dear Public Library System,” the ad began, “We hope you use some of the $12 million in hotel taxes to keep the library open later.” There was even a valediction at the bottom: “Love, Airbnb.” San Francisco State professor Martha Kenney’s October 21st Facebook post of the ad went viral, as did her analysis that Airbnb’s taxes could, in fact, keep the libraries open only a few minutes later each day. Later that day, the company’s apology came. To be clear: these ads bragging about Airbnb paying its taxes were so ill-conceived that many people (myself included) at first thought they were a joke. Since then, this marketing misfire has been read as a typically clueless and/or condescending and/or abrasive move by an insular and out-of-touch culture. But what this misfire brings to light is something deeper that this one particular failure. At heart, the Airbnb ads highlight the affective and aesthetic characteristics of contemporary tech culture: camp, cuteness, a particular flavor of sincerity, and an underlying messianism. 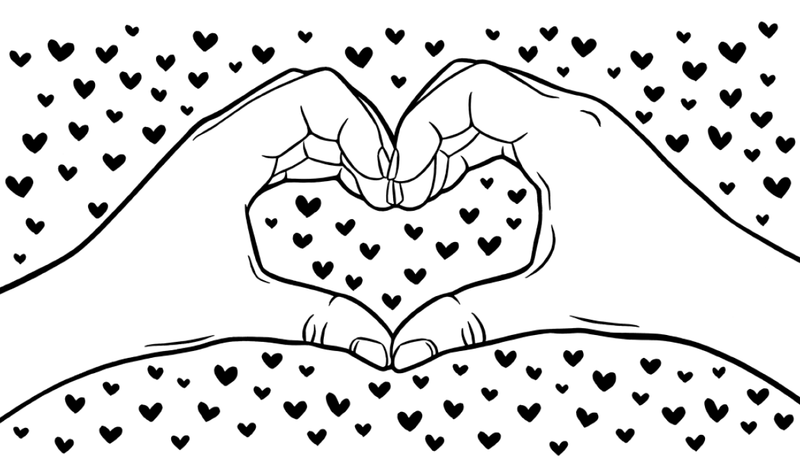 This culture marks everything from the branding of the new multinational conglomerate that owns Google as “Alphabet” to the recent holiday commercial of Apple employees and Microsoft employees hugging each other. Because this aesthetic is usually deployed more successfully, it’s also more invisible in daily rhetoric than the failed letter-to-the-library ad. Start with “Love, Airbnb.” The marketplace platform Airbnb can no more love the public library system than it can eat a burrito. This move can only be described as camp—as per Susan Sontag’s definition, an intentional and self-referential theatricality. To paraphrase Sontag, camp is a way of seeing everything in quotation marks, where it lives in the space between pure artifice and some kind of meaning. What makes camp interesting is the tension between its alleged innocence and its winking at itself, its utter failure at being serious. Camp skates on the surface. Camp dethrones the serious and at its most successful creates conditions where taking things seriously is an embarrassment to those who would try to be serious. To be fair, a lot of advertisement relies on camp in order to operate. 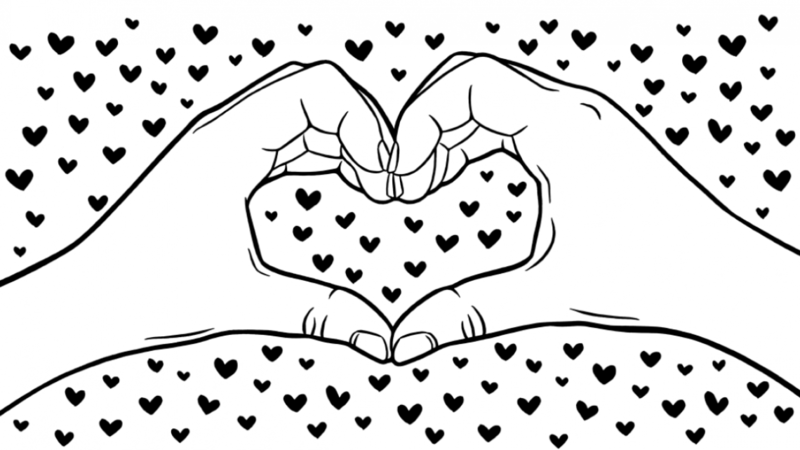 What is unique about this particular instance of camp is its attempt at sweetness, caring, cuteness—to create an effect of sincerity that is too playful to be held responsible. The failed effect of sincerity of the Airbnb ads is deeply reminiscent of the “new sincerity” movement of the last 30 years in which a group of largely poets and musicians have taken an intentionally anti-cynical stance in their writing as an act of revolution against the irony of late capitalism. Critics of new sincerity point to its childishness; the poetry is often insistently, even aggressively simplistic. The new sincerity arguably reached its peak as a movement in the early 2000s. For historical context, think of David Foster Wallace’s exonerations about morality in his Kenyon College commencement address as a contemporaneous backdrop for the adoption of Google’s slogan “Don’t be evil” in the early 2000s. “Don’t be evil” is childishly sweet and points to a kind of sincere ethics, but it fails as a meaningful, serious standard for corporate behavior. So what is sincerity without seriousness? Almost by definition, it’s cuteness itself. Cute, as Sianne Ngai expresses it, is a response to the diminutive, the weak, and the subordinate.1 Cute relaxes us. But it’s also a political aesthetic. For Ngai, an affect of cuteness is formed by a relationship that is predicated on an encounter where one subject has more power than another. The object that’s cute is usually in the position of less power: helpless, pitiful, in need of our care and protection. For a tech company to present itself as cute is to ask us to see it as less powerful than it actually is. When exactly did tech get so cute and anti-critical? My hypothesis here is that the mid-2000s was a turning point, when “new sincerity” was strongest in the air during the recovery from the first dot-com boost. Of course there are many more concrete, practical factors for this aesthetic as well. As just one example, the outward-facing rhetoric of many of these companies is based on design thinking, characterized by user-first simplicity and empathy. But there is a strong relationship between cuteness, anti-criticality, and anti-elitism by the most elite companies in the world that demands careful scrutiny. This is the deepest rhetoric of tech: we are just around the corner from simpler and better. That the most ruthless companies in tech are able to further their messianistic agenda while appealing to the weak, minor, even childish aesthetics of cuteness and camp is one of the most bizarre and uncanny aspects of contemporary culture; but given the power of these minor aesthetics to insulate from criticism makes the hearts and cartoon birds and twee Google Doodles some of the most hard-working symbols in the new culture wars. Airbnb’s only mistake was trying to anchor this abstraction in the economic logic and concrete language that the rest of us operate in. 1) Sianne Ngai, Our Aesthetic Categories. Harvard University Press. 2) Ngai, Our Aesthetic Categories, p. 88. 3) Jason Morris, The Time Between Time: Messianism & the Promise of a “New Sincerity”, Jacket 35 (2008).